Click here for our Spring 2019 calendar of upcoming LED events! Sundays are BRIGHT and EXCITING with L.E.D.! 6th, 7th, & 8th graders grow in their faith while interacting with God’s Word, participating in authentic worship and building friendships with other students. L.E.D. is an electric environment for middle school students on Wednesday nights! We have games, videos, small group discussions and the practical teaching from God's Word that students need. Circuits, our LED Middle school small groups meet during this time. Here we see faith come alive in a prayerful community that asks honest questions, searches God's Word, cares for one another, and laughs together. Come check it out this Wednesday! We begin at 7:00 pm, and the night wraps up at about 9:00pm. See you this Wednesday! 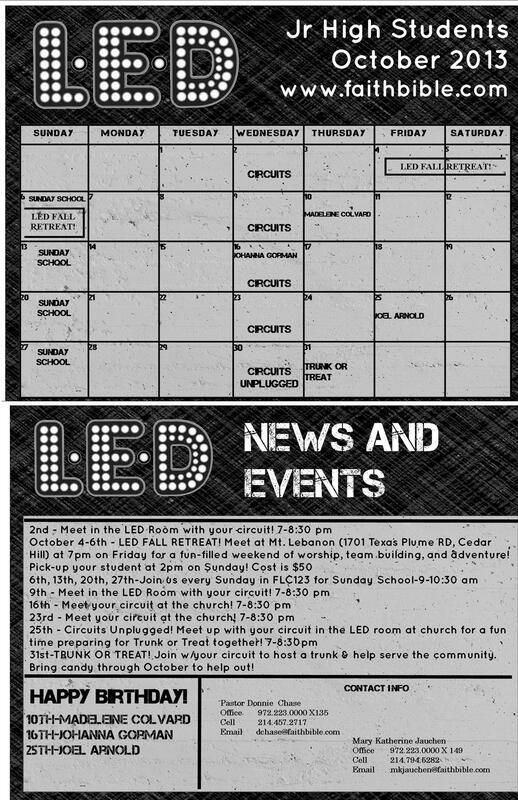 Contact the Faith Student Ministries office today to get plugged in to L.E.D!